Stochastics researcher and group leader Bert Zwart is selected to be part of the 'Economentop 40' of 2017, which lists the forty Dutch economists with the highest publication rate in peer reviewed magazines over the past five years. 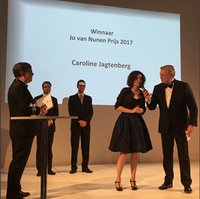 Caroline Jagtenberg, former PhD student of CWI, received the prestigious Jo van Nunen award for her CWI PhD thesis “Efficiency and Fairness in Ambulance Planning” on 30 November. The prize has been awarded by VLM (Vereniging Logistiek Management). Centrum Wiskunde & Informatica and ProRail recently started a research collaboration in the area of the handling of incidents at the Dutch railways. It concerns a public private partnership between CWI and ProRail striking up a four year period. The research is aimed at prevention and handling of a broad spectrum of railway incidents, like disturbance of the railway infrastructure, people walking on the tracks and collisions. The North/Southline is the largest operation in Amsterdam’s public transport in decades. That is why the municipality of Amsterdam will start an extensive impact study together with knowledge institutions, the transport region Amsterdam and GVB (public transport company Amsterdam). Centrum Wiskunde & Informatica (CWI) will act as one of the main research partners.